Kingdom Hearts 3 Reveals Classic LCD Mini-Games | Nerd Much? Kingdom Hearts 3, the game which is supposedly coming this year, has a great many people excited. So when Square Enix debuts new game footage, footage of a mode we’ve never seen before, it’s kind of a big deal. 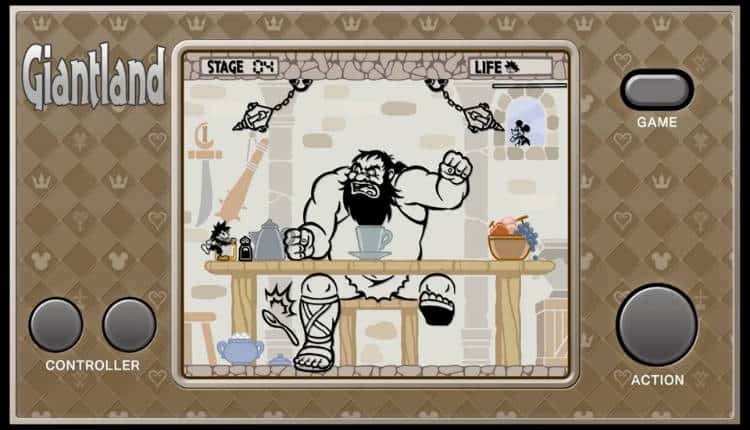 That’s precisely what the developer has done with their unveiling of the Classic Kingdom trailer for the game. The new mode consists of1980s inspired retro LCD games that would make any Game & Watch fan proud. Within the trailer we get to see five of these LCD games in action. The first consists of Mickey and Sora climbing scaffolding while Pete throws materials down upon them. The goal is to rescue Minnie without taking damage. The next game is titled “The Barnyard Battle”. Here, you’ll control both Sora and Mickey as they fight off enemies with a hammer as they attempt to infiltrate your fort from four different vertical rows. Following The Barnyard Battle is “TheKarnivalKid”. This mini-game is restaurant themed. Donald Duck, Pluto, Minnie Mouse and others are placing their food orders at the carnival. Mickey is at the bottom of the screen handing out ingredients while Sora is tasked with completing accurate orders for his patrons. Giantland is the next mini-game shown. This game looks pretty complex in comparison to some of the others portrayed. Sora is on a table hiding while a giant is seating trying to squash him. Sora has to hide behind cover and advance at opportune times. He’ll eventually navigate his way up towards a swinging chandelier. Then finally jump out the window at the top right of the screen where Mickey is waiting to help Sora make his escape. The final LCD game shown is called “Musical Farmer”. This game features six chickens atop the screen. They continually lay eggs which make their way down tubes towards Sora. Sora must adjust the tubes directions to properly navigate the eggs, while simultaneously making sure the egg baskets at the bottom get deposited to Mickey and Minnie at opposite sides of the screen. It looks pretty frantic. These classic LCD games are probably minute in comparison to the grand scheme of things. They’re likely only implemented as a fun distraction to the core game and narrative. Still, they look fun nonetheless. While some may be skeptical, Square Enix is still slotting Kingdom Hearts 3 to be released on PlayStation 4 and Xbox One later this year.